In an August 6, 2009 per curiam Order issued in the case of Gaudio v. Ford Motor Company, the Pennsylvania Superior Court denied a request to hear additional arguments regarding a defendant's right to introduce evidence concerning seat belt usage, or the lack thereof, in products liability cases involving questions about an automobile's crashworthiness. This Order effectively upholds the Superior Court's 2-1 decision, found at ruling that the trial court should not have allowed any reference to the plaintiff's decedent's failure to wear a seatbelt in a crashworthiness case. 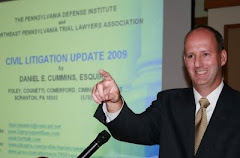 Judge James Fitzgerald III dissented on this issue in the prior Superior Court opinion and suggested that the Courts could use guidance from the Pennsylvania Supreme Court on whether any and all evidence pertaining to the lack of seatbelt use should be precluded under all circumstances. The original 2-1 Superior Court decision can be found on Westlaw at 2009 WL 1530669, and the Pike County trial court opinion by Judge Harold A. Thomson, Jr. can be found at 2007 WL 5077415. It remains to be seen now whether the defense will appeal this case up to the Pennsylvania Supreme Court.